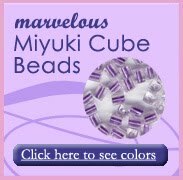 I am often asked for recommendations of other materials that would be suitable for use with Swarovski crystal beads. One of the best things about Swarovski crystal beads is that they are extremely versatile and can be dressed up or dressed down. They can be used to add a subtle hint of sparkle or be dominant in a piece. My first piece of advice is that anything goes with Swarovski crystal beads as long as you can design it right. This may seem a bit vague, but it will keep your mind open to all possibilities. Sometimes I find that Swarovski crystal beads are "too perfect" to mix with certain gemstones. In this case, I have done several things: 1) mix a whole assortment of shapes, colors and sizes in order to "blend" the natural materials and crystals (see photo of green gems necklace above), or 2) consider asymmetrical Swarovski beads such as cubist, helix, or cosmic shapes. Choose your findings carefully. The right style and color of findings can be the last detail that pulls your design together. Sometimes it's as simple as choosing the right toggle clasp. 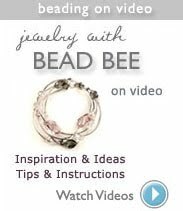 I have seen Swarovski crystal beads beautifully combined with Wood Beads, Czech Glass Beads, Toho Seed Beads, Gemstone Beads, Pearls, and Sterling Silver. Because the colors of Swarovski crystals are so brilliant, be mindful of the color combinations that you are creating as you design your piece. Take a look at our Color Palette for advice and recommendations on creating pleasing color combinations. Thanks for reading!!! I haven't had much time to scrapbook lately, but recently, a lot of scrapbookers have been buying alphabet beads from our store, and I just couldn't resist putting together some personalized embellishments and taking the opportunity to catch up on my scrapbooking projects. I posted ideas on our Scrapbooking ideas page, which also include layouts from Alex's sorority scrapbook where she used alphabet beads and sports beads in a really adorable way. 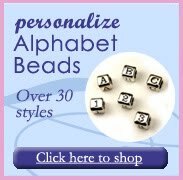 Beads and charms are also a really nice way to create personalized greeting cards and gift wrapping. Let me know what you think and if you have any other ideas of your own.